Maojia Industry is a leader of engine bearing in domestic, because of applying the new technology and solution to technology difficulites and keep OE quality. Our products improve the disadvantage of all the main bearing,making them longer use life. 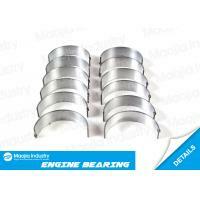 Maojia Industry already supply more than 1000 kinds of internal combusion engine bearings to the global aftermarket. At present, our company is the only one factory in China producing thrust bearing who can reach the OE quality. The successful research and develop of the product fills in the blank of edge bearing technology, and open a new situation for edge bearing. 1. Experienced engineers and technical team. 2. Years of OEM experience in China and overseas. 3. High quality and superior materials. 4. Advanced R&D software and analysis expertise. 5. More than 100 technology patents. 6. Automatic equipment designed by ourselves with innovative production technology. 7. No1 in the thrust bearing technology in China.